This Wednesday August 1, 2012 we’re going to have an open meeting. Come and talk about what’s on your mind and what’s happening in your life. The topic this Wednesday July 11, 2012 is the Affordable Care Act (i.e. Obamacare). We are specifically going to talk about how this affects you and HIV positive People . The United States Supreme Court upheld President Obama’s health care law that provides health coverage for millions of Americans who are uninsured. This historic act has paved the way for so many Americans to get coverage that was previously denied to them just a few years ago. For people living with HIV/AIDS this decision is without question a victory. Here are three ways that the Affordable Care Act helps. No more denial of health insurance due to “pre-existing conditions.” People who are HIV positive or have full blown AIDS have been discriminated against for years through the term “pre-existing condition.” They were either denied coverage or given a really high premium to pay. This act now eliminates that by making it illegal for insurance companies to deny a person for having HIV. There are probably other legal ways that insurance companies can deny a person, so it’s wise to stay as healthy as possible. “Donut hole” closure. Some patients who are HIV positive depend on Medicare Part D for assistance to pay for medications. Before this law, there was a gap between where the coverage ended and where the patient had to pay out-of-pocket called the “donut hole.” The closure of this hole doesn’t necessarily make medications free for everyone but it will help reduce the cost for the patients. Hopefully this will keep patients compliant with their medication routine. Healthcare access will be expanded. Insurance exchanges (where you can sorta shop for insurance) and expanding the Medicaid program will help people with HIV/AIDS get coverage. They will have access to medications and treatment which can also help with other co-morbidities that they such as diabetes or high blood pressure. 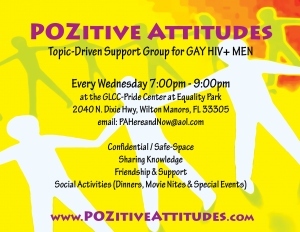 This Wednesday, May 30, 2012 the group will be lead by Jim G. Please come and support him. The topic will be Traveling Gay/HIV. SUMMERTIME IS RIGHT AROUND THE CORNER AND THE GREEN LIGHT IS ON TO TRAVEL THE HIGHWAYS OF THE WORLD BUT ALL IS NOT THE FRIENDLY SKIES FOR THE HIV/GAY TOURIST. THE GAY TOURIST SPENDS TWICE AS MUCH ON TRAVEL AS OUR NON GAY SINGLE COUNTERPARTS. I WILL TALK ABOUT NATIONAL- INTERNATIONAL TRAVEL SPOTS. CUBA, SOUTH AMERICA, EUROPE, MEXICO AND CRUISING THE 7 SEAS. 1. WHAT TO KNOW BEFORE YOU GO, PASSPORT LIMITATIONS (6 MONTH RULE) BANK NOTICE, RETURN INFO WHERE NOT TO STAND IN LINE. 2. WHERE THE MOST POPULAR PLACES TO VISIT , IMPORTANT UP TO DATE INFORMATION. 3. DANGER WILL ROBINSON NON GAY ZONE AHEAD , WE HANG BALLS ON OUR CHRISTMAS TREES SOME PLACES HANG GAYS. 4. A LIST OF OFF LIMITS ENTRY TO GAY/ HIV TOURISTS. The topic this Wednesday March 7, 2012 is Commitment. A great business leader once said: “…the basic philosophy, spirit, and drive of an organization have far more to do with its relative achievements than do technological or economic resources, organizational structure, innovation, and timing. All these things weigh heavily in success. But they are, I think, transcended by how strongly the people in the organization believe in its basic precepts and how faithfully they carry them out.” (from Thomas J. Watson, Jr., A Business and its Beliefs – The ideas that helped build IBM). As true as this is for the success of a corporation, it is even more so for the individual. The most important single factor in individual success is COMMITMENT. Commitment ignites action. To commit is to pledge yourself to a certain purpose or line of conduct. It also means practicing your beliefs consistently. There are, therefore, two fundamental conditions for commitment. The first is having a sound set of beliefs. There is an old saying that goes, “Stand for something or you’ll fall for anything.” The second is faithful adherence to those beliefs with your behavior. Possibly the best description of commitment is “persistence with a purpose”.